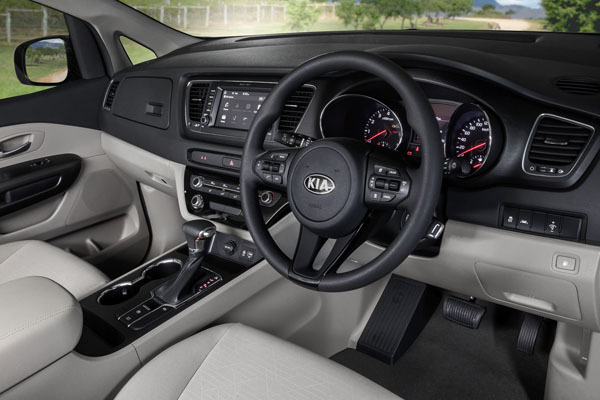 Kia’s Carnival eight-seat people mover has been enhanced with a facelift and range of safety and comfort upgrades in a mid-life freshen up. Kia’s stylists have revised the look of the ‘tiger nose’ grille and there are sleeker headlight clusters that sweep into the grille. Integrated foglights are part of the revision. At the rear the lower tailgate panel and rear three-quarter panels have been mildly reshaped. As befits a vehicle aimed at carting kids safety is paramount and every model now comes as standard with autonomous emergency braking and lane departure warning. Infotainment keeps the kids from playing up – well playing up too much – so Carnival now has Kia’s new in-house designed audio/visual head unit which supports Apple CarPlay and Android Auto. Again, this is fitted to all grades. however, there is a 7-inch screen for the entry-level S model, while the Si, SLi and Platinum have an 8-inch unit. An impressive enhancement is that the satellite navigation in Carnival Si, SLi and Platinum grades and comes with 10 years of free MapCare support. Carnival Si, SLi and Platinum have an eight-speaker JBL Premium sound system. A feature of the Carnival is the ‘stand-up’ seats in the second row, which allows the base cushion to fold forward and the rest of the seat to slide forward and ‘stand up straight’, allowing easier access to the third row in the back. A 60:40 split-folding third row of seats can be folded completely flat to provide a large cargo area. The centre seat in the second row can be removed or folded down to provide additional cupholder storage for rear passengers. There are numerous storage spaces throughout the cabin, including a large centre console storage with a sunglass storage bin, slide-open tray in the second row of Platinum models (it folds out in the other models), and seat-back pockets. There are no fewer than 10 drinkholders and four bottle holders. The storage area under the front armrest holds items as large as a laptop. The cargo area is a very useful 960 litres behind the third row of seats and increases all the way to 2220 litres behind the second row and a 4022 litres when all rear passenger seats are stowed. 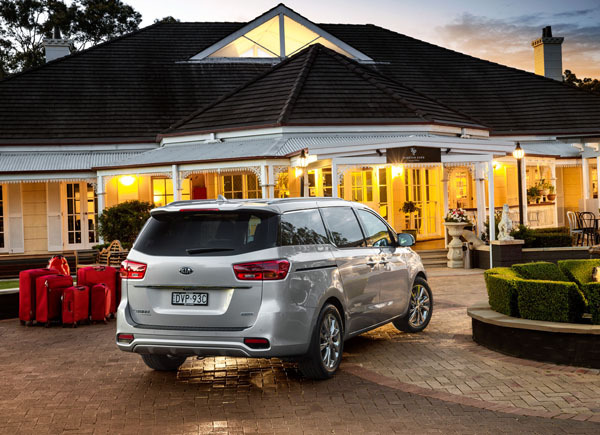 Power for Kia Carnival continues to be provided by a 3.3-litre petrol engine or a 2.2-litre R turbo-diesel. As part of this midlife enhancement both units have been re-engineered for greater efficiency and performance and are now linked to a standard eight-speed automatic gearbox that has a sequential manual shift mode. All Kia models for sold here have their ride and handling built to suit Australian drivers’ tastes and our sometimes rough n’ ready backroads. The 2018 Carnival has had minor revisions. 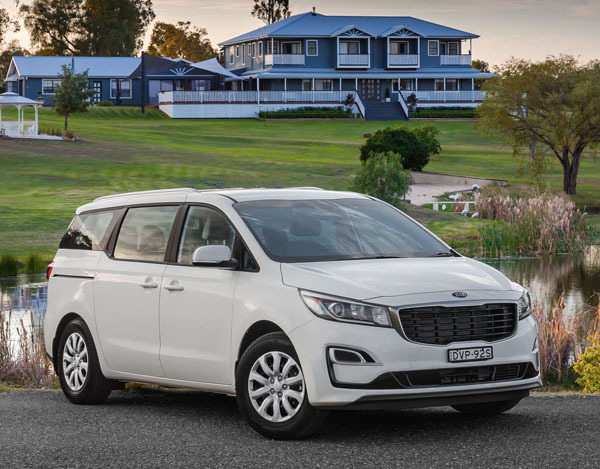 Unfortunately, pressure of business (overlapping vehicle releases) meant we were unable to attend the introduction of the upgraded Kia Carnival in the Hunter Valley so we can’t provide driving impressions yet. We will book a Carnival for testing in our home area of the Gold Coast and itemise our feelings afterwards.